Prepare yourself for the 39th Annual Alcatraz XXXIX “Escape from the Rock” Duathlon. 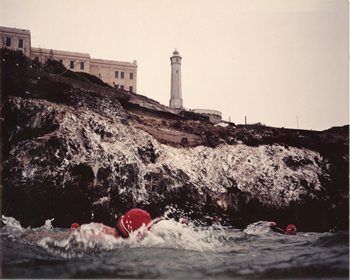 The course combines the original swim from Alcatraz with an 7 mile run to Fort Point and back to Aquatic Park. You have heard the stories, you’ve seen the movies, you know the infamous inmates, but NOW it’s your turn to make history on the ESCAPE course! As the tourists ferry to the island, you’ll be swimming away as you make the ULTIMATE ESCAPE! The event is limited, so don’t wait to register! COURSE CUT-OFF TIME: 3.5 HOURS (The swim must be completed within 75 minutes). AID STATIONS: There will be aid stations at miles 2 and 5. Aid will also be available in the transition area. INCENTIVES: T-shirts for all participants. Finisher medals for all participants (duathletes & swim-only). Personalized award plaques to top three individual duathlete finishers in each age group, first place overall Clydesdale & Athena finishers, first place relay team in each division (male, female, co-ed), first place swim-only finishers in each age group. Two pairs of Merrell shoes raffled off to two lucky runners at the race. RACE PACKETS: (containing swim cap, run bib number, timing chip, & t-shirt) are picked up on race day morning in the Senior Center which is located on the first floor of the Maritime Museum. Full details on this pick-up will be e-mailed to all paid participants and posted on this web page a week or two prior to race day. If you did not submit a valid e-mail address when registering for this event, please notify us at info@envirosports.com. DRIVING DIRECTIONS: Google Maps Link to start/finish area. CANCELLATIONS: Registrations are non-refundable and non-transferable. If you email us by July 10, 2019, you may receive a rollover credit (the amount you paid minus a $35 fee) to use toward any future Enviro-Sports race. HEADPHONES POLICY: Headphones (or any other audio device, swimp3 players, etc.) are NOT allowed during either leg of this event. XTERRA WETSUITS is an official wetsuit sponsor for the 2019 Alcatraz XXXIX Escape from the Rock. As part of our partnership, race participants receive exclusive discounts on the XTERRA WETSUITS product line, ranging from 30-55% off Vortex Sleeveless & Fullsuit, Vector Pro Sleeveless & Fullsuits, and Velocity M Speedsuit triathlon wetsuits, and have the opportunity to win XTERRA WETSUITS at the race. Visit www.xterrawetsuits.com/ctc and use coupon code R-ENV to purchase or rent the best selling triathlon wetsuit in North America! SPORTS BASEMENT (Northern California events) rents Blueseventy Reaction & Fusion wetsuits, an entry level suit great for getting accustomed to swimming in open waters. They do not recommend using the wetsuit in chlorinated water. Wetsuit rentals are available at all of their store locations. The rental cost is $40-$60 for 2-5 days, $60-$90 for 6-12 days or $80-$120 for 1 month, and up to $150 in rental fees may be applied towards the purchase of a new wetsuit within 90 days of your first rental of the current season. Proof of rental payment required. To find out more about a SPORTS BASEMENT wetsuit rental, click here. August 10 6:30 AM PDT - Athlete Check-in and Transition Set-up.